After several false starts it now appears that the UK is about to embrace the articulated bus. Stagecoach were the leaders in the late 1990s with coaches for their express services. First soon followed with conventional buses which were deployed in cities such as Manchester, Leeds and Glasgow. All the major companies now own bendibuses apart from Arriva. Even London has taken them in large numbers. There has indeed been an artic conquest. It all started in Sheffield - twice. South Yorkshire PTE took five MAN artics on trial in 1979 (below left) and then bought four Leyland-DAB artics in 1980. By 1983 the Leyland examples had been withdrawn and sold to McGill of Barrhead (above left) who used them on his service to Glasgow. Subsequently they saw further life with Hampshire Bus in Winchester. Once bitten, twice shy normally. However SYPTE came back for more, and bought fourteen Leyland-DAB examples in 1985 for use on City Clipper services (above right) and then the express to Meadowhall shopping centre. It was to be 10 more years till artics were bought in the UK. Stagecoach were the first to dip their toe in the water with new generation artics and have two batches dating from 1996 and 1999. They are Volvo B10M coaches with a mixture of Plaxton (left) and Jonckheere (right) bodies that operate on express services from Glasgow to Ayrshire. Long before mainland operators started buying artics, Citybus in Belfast operated this Van Hool example (upper left). On the southern side of the Irish border Dublin has recently taken a small batch of Wright Solar bodied vehicles (lower left). And as expected artics have found acceptance at the airport (right). 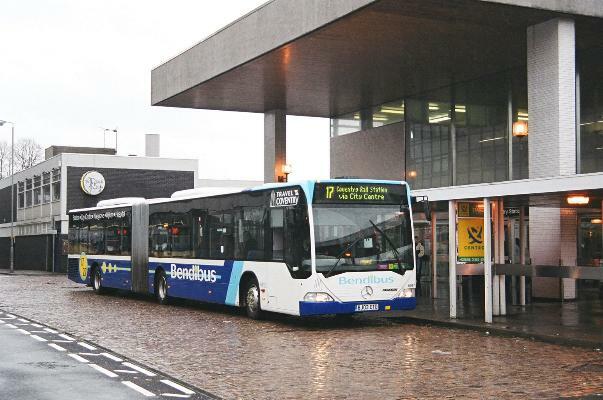 Articulated buses have of course been a way of life on the European mainland for years (left). Now that these vehicles are being employed in London as part of the Routemaster replacement program they have gained a much higher profile in the UK. Off-bus ticketing is even catching on, as prototyped on Red Arrow services (right). Soon the right to sit down on a short city bus journey will fade into history. Forget the gym - just surrender to the artic conquest. Travel Coventry 6017 (BJ03ETD), one of 10 Mercedes Citaros, at a very wet Coventry rail station in January 2004. McGill FHE292V at Paisley in June 1983. It was one of five similar DAB artics originally delivered to South Yorkshire PTE. South Yorkshire PTE 2003 (C103HDT), saggy in Sheffield in September 1989. This batch of 14 DAB artics even re-used the fleet numbers from the first batch. First 132 (W132WPO), a Wright Solar-bodied Volvo artic in Southampton in October 2002. These vehicles have since moved on. 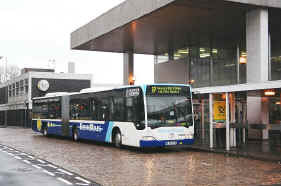 First 2003 (S993UJA), a Wright-bodied Volvo in Bury bus station in April 2001. These vehicles operate on the trunk service to Manchester city centre. Go Northern 4951 (NK541OLU) at Gateshead - the only building site with its own bus station - in April 2003. It is one of four Wright-bodied Scanias that operate between Gateshead and the Metro Centre. Meteor Parking YN51XLZ, one of six Neoplan Centroliners, at Stansted Airport in July 2002. Citybus 3000 (DAZ3000), one of two Van Hool bodied Volvo B10Ms, delivered in 1994 and seen in Belfast in December 1995. Dublin Bus AW11 (00-D-65011), a Wright Solar-bodied Volvo B7, in Dublin in August 2003. It is one of 20 such vehicles. Aircoach Mercedes Citataro 02-D-5902 in Travel Dundee livery at Dublin airport in August 2003. Bochum 9367-bo-jr-122, a standard Mercedes 0405 artic, in Bochum in June 1996. London now had a substantial amount of Mercedes Citaros in service such as MAL25 (BX02YYN) of London Central seen on Red Arrow route (507) at Victoria in September 2002. First 10042 (W129DWX) in York on Park and Ride duty in April 2004.